Digital Enhanced Cordless Telecommunications (Digital European Cordless Telecommunications), usually known by the acronym DECT, is a standard primarily used for creating cordless telephone systems. It originated in Europe, where it is the universal standard, replacing earlier cordless phone standards, such as 900 MHz CT1 and CT2. Beyond Europe, it has been adopted by Australia, and most countries in Asia and South America. North American adoption was delayed by United States radio frequency regulations. This forced development of a variation of DECT, called DECT 6.0, using a slightly different frequency range. The technology is nearly identical, but the frequency difference makes the technology incompatible with systems in other areas, even from the same manufacturer. DECT has almost universally replaced other standards in most countries where it is used, with the exception of North America. DECT is used primarily in home and small office systems, but is also available in many private branch exchange (PBX) systems for medium and large businesses. 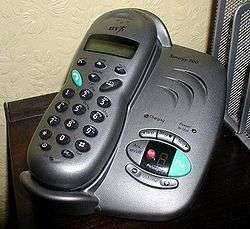 DECT can also be used for purposes other than cordless phones. Voice applications, such as baby monitors, are becoming common. Data applications also exist, but have been eclipsed by Wi-Fi. 3G and 4G cellular also competes with both DECT and Wi-Fi for both voice and data. DECT is also used in special applications, such as remote controls for industrial applications. In 2011, development of a low power variant (DECT ULE — ultra low energy) was initiated to take advantage of the existing data channels for DECT to address markets such as home automation, security and climate control. The low power variant enables this standard to be used in battery powered devices and for many devices in the home to be connected through a single control unit. The DECT standard includes a standardized interoperability profile for simple telephone capabilities, called GAP, which most manufacturers implement. GAP-conformance enables DECT handsets and bases from different manufacturers to interoperate at the most basic level of functionality, that of making and receiving calls. The standard also contains several other interoperability profiles, for data and for radio local-loop services. The DECT standard fully specifies a means for a portable unit, such as a cordless telephone, to access a fixed telecoms network via radio. But, unlike the GSM standards, does not specify any internal aspects of the fixed network. Connectivity to the fixed network (that may be of many different kinds) is done through a base station or "Radio Fixed Part" to terminate the radio link, and a gateway to connect calls to the fixed network. In most cases the gateway connection is to the public switched telephone network or telephone jack, although connectivity with newer technologies such as Voice over IP has become available. There are also other devices such as some baby monitors utilizing DECT, and in these devices there is no gateway functionality. Domestic cordless telephony, using a single base station to connect one or more handsets to the public telecommunications network. Enterprise premises cordless PABXs and wireless LANs, using many base stations for coverage. Calls continue as users move between different coverage cells, through a mechanism called handover. Calls can be both within the system and to the public telecommunications network. Public access, using large numbers of base stations to provide high capacity building or urban area coverage as part of a public telecommunications network. Of these, the domestic application (cordless home telephones) has been extremely successful. The enterprise PABX market had some success, and all the major PABX vendors have offered DECT access options. The public access application did not succeed, since public cellular networks rapidly out-competed DECT by coupling their ubiquitous coverage with large increases in capacity and continuously falling costs. There has been only one major installation of DECT for public access: in early 1998 Telecom Italia launched a DECT network known as "Fido" after much regulatory delay, covering major cities in Italy. The service was promoted for only a few months and, having peaked at 142,000 subscribers, was shut down in 2001. DECT has also been used for Fixed Wireless Access as a substitute for copper pairs in the "last mile" in countries such as India and South Africa. By using directional antennas and sacrificing some traffic capacity, cell coverage could extend to over 10 kilometres (6.2 mi). In Europe the power limit laid down for use of the DECT spectrum (250 mW peak) was expressed as effective radiated power (ERP), rather than the more commonly used equivalent isotropically radiated power (EIRP), permitting the use of high-gain directional antennas to produce much higher EIRP and hence long ranges. The standard is also used in electronic cash terminals, traffic lights, and remote door openers. The "6.0" in DECT 6.0 does not equate to a spectrum band, but is a marketing term coined by Rick Krupka while at Siemens for DECT devices manufactured for use in the United States and Canada. Although DECT 6.0 operates at 1.9 GHz, it was decided the term DECT 1.9 might have confused customers who equate larger numbers (such as the 2.4 and 5.8 in existing 2.4 GHz and 5.8 GHz cordless telephones) with later products. The DECT and DECT 6.0 technologies are essentially identical, except for operating frequency. The term DECT 6.0 is also sometimes inappropriately advertised in Australia, even though Australia uses the same allocated spectrum frequencies as Europe. DECT 6.0 Plus is a proprietary extension of DECT 6.0 from Panasonic which adds additional features. To facilitate migrations from traditional PBXs to VoIP, manufacturers such as Gigaset (formerly Siemens), Lantiq, Ascom, Mitel/Aastra, Philips, snom, Grandstream, Yealink and Spectralink developed IP-DECT solutions where the backhaul from the base station is via VoIP (H.323 or SIP) over Ethernet, while communications between base and handsets is via DECT. DECT was originally intended for use with traditional analog telephone networks, but DECT bases have higher bit-rates at their disposal than traditional analog telephone networks could provide. To take advantage of these higher-speed networks, ETSI released the CAT-iq standard in 2005, which, among other features, standardizes wideband audio over DECT. CAT-iq is backwards compatible with GAP. For enterprises, DECT with (wired) VoIP backhaul has several significant advantages and disadvantages in comparison to VoIP-over-WiFi, where, typically, the handsets are directly WiFi+VoIP-enabled (instead of having the DECT handset communicate via an intermediate VoIP-enabled base). On the one hand, VoIP-over-WiFi has a range advantage given sufficient access-points, while a DECT phone must remain in proximity to its own base (or repeaters thereof). On the other hand, for large networks VoIP-over-WiFi imposes significant design and maintenance complexity to ensure roaming facilities and high quality-of-service. In North America, DECT suffers from major deficits, especially in comparison to DECT elsewhere, since the UPCS band (1920–1930 MHz) used for DECT in North America is not free from heavy interference and only half as wide as that used in Europe (1880–1900 MHz), the 4 mW average transmission power limits the range to far less than the 10 mW permitted in Europe, and the commonplace lack of GAP compatibility among US vendors binds companies to a single vendor. Other alternatives to DECT-plus-VoIP include local microcells (e.g. with OpenBTS), which then enables use of standard cellular phones for local "in-house" telephony. In the Far East, in particular in Japan and Taiwan, the Personal Handy-phone System renders the "in-house" (and PBX) concept superfluous by making the entire "last-mile" wireless. The latest DECT variant is DECT ULE, or DECT Ultra low energy. The standard was first discussed in January 2011 and the first commercial products were launched later that year by Dialog Semiconductor. Like DECT, DECT ULE standard uses the 1.9 GHz band, and so suffers less interference than Zigbee, Bluetooth, Wi-Fi, from microwave ovens, which all operate in the ISM unlicensed 2.4 GHz band. The standard has been created to enable home automation, security, healthcare and energy monitoring applications that are battery powered and can easily connect to the Web using the large number of existing DECT enabled modems and can be managed using a smartphone. The DECT standard was developed by ETSI in several phases, the first of that took place between 1988 and 1992 when the first round of standards were published. These were the ETS 300-175 series in 9 parts defining the air interface, and ETS 300-176 defining how the units should be type approved. A technical report, ETR-178, was also published to explain the standard. Subsequent standards were developed and published by ETSI to cover interoperability profiles and standards for testing. Initially named "Digital European Cordless Telephone" at its launch by CEPT in November 1987, following a suggestion by Enrico Tosato of Italy, its name was soon changed to "Digital European Cordless Telecommunications" to reflect its broader range of application, including data services. In 1995, due to its more global usage, the name was changed from "European" to "Enhanced". It is an ETSI standard for digital portable phones (cordless home telephones), commonly used for domestic or corporate purposes. It is recognized by the ITU as fulfilling the IMT-2000 requirements and thus qualifies as a 3G system. Within the IMT-2000 group of technologies, DECT is referred to as 'IMT-2000 Frequency Time' (IMT-FT). DECT was developed by ETSI but has since been adopted by many countries all over the World. The original DECT frequency band (1880 MHz–1900 MHz) is used in all countries in Europe. Outside Europe, it is used in most of Asia, Australia and South America. In the United States, the Federal Communications Commission in 2005 changed channelization and licensing costs in a nearby band (1920 MHz–1930 MHz, or 1.9 GHz), known as Unlicensed Personal Communications Services (UPCS), allowing DECT devices to be sold in the U.S. with only minimal changes. These channels are reserved exclusively for voice communication applications and therefore are less likely to experience interference from other wireless devices such as baby monitors and wireless networks. Multiple handsets to one base station and one phone line socket. This allows several cordless telephones to be placed around the house, all operating from the same telephone jack. Additional handsets have a battery charger station that does not plug into the telephone system. Handsets can in many cases be used as intercoms, communicating between each other, and sometimes as walkie-talkies, intercommunicating without telephone line connection. Interference-free wireless operation to around 100 metres (110 yd) outdoors, much less indoors when separated by walls. Operates clearly in common congested domestic radio traffic situations, for instance, generally immune to interference from other DECT systems, Wi-Fi networks, video senders, Bluetooth technology, baby monitors and other wireless devices. ETSI standards documentation (ETSI EN 300 175-1/2/3/4/5/6/7/8, REN/DECT-000268-1/2/3/4/5/6/7/8) prescribes the following technical properties for DECT. Frequency: Section 4.1.1 ("Nominal position of RF carriers") of the ETSI standard states: "DECT carriers are specified for the whole frequency range 1880 MHz to 1980 MHz and 2010 MHz to 2025 MHz. Carrier positions in the 902 MHz to 928 MHz ISM band and the 2400 MHz to 2483,5 MHz ISM band have been defined for the U.S. market. 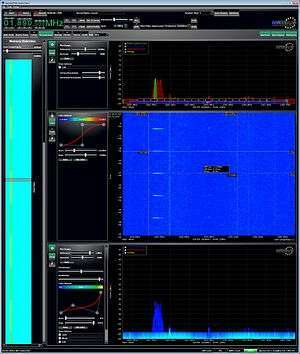 [...] The most common spectrum allocation is 1880 MHz to 1900 MHz, but outside Europe spectrum is also available in 1900 MHz to 1920 MHz and in 1910 MHz to 1930 MHz (several countries)." North-American DECT ("DECT 6.0") products may not be used in Europe and Africa, as they cause and suffer from interference with the European and South African cellular networks. Use of such products is prohibited by European Telecommunications Authorities and the Independent Communication Authority of South Africa. European DECT products may not be used in the United States and Canada, as they likewise cause and suffer from interference with American and Canadian cellular networks, and use is prohibited by the Federal Communication Commission and Industry Canada. As DECT and DECT 6.0 do not operate in the 2.4 GHz ISM band, they are not subject to, nor cause interference with, 802.11b and 802.11g Wi-Fi, and 2.4 GHz cordless phones. As such, they are sometimes marketed as 'WiFi friendly'. This means that the radio spectrum is divided into physical channels in two dimensions: frequency and time. The maximum allowed power for portable equipment as well as base stations is 250 mW. A portable device radiates an average of about 10 mW during a call as it is only using one of 24 time slots to transmit. The DECT media access control layer controls the physical layer and provides connection oriented, connectionless and broadcast services to the higher layers. The DECT data link layer uses Link Access Protocol Control (LAPC), a specially designed variant of the ISDN data link protocol called LAPD. They are based on HDLC. All these communicate through a Link Control Entity (LCE). The call control protocol is derived from ISDN DSS1, which is a Q.931-derived protocol. Many DECT-specific changes have been made. The mobility management protocol includes many elements similar to the GSM protocol, but also includes elements unique to DECT. Unlike the GSM protocol, the DECT network specifications do not define cross-linkages between the operation of the entities (for example, Mobility Management and Call Control). The architecture presumes that such linkages will be designed into the interworking unit that connects the DECT access network to whatever mobility-enabled fixed network is involved. By keeping the entities separate, the handset is capable of responding to any combination of entity traffic, and this creates great flexibility in fixed network design without breaking full interoperability. DECT GAP is an interoperability profile for DECT. The intent is that two different products from different manufacturers that both conform not only to the DECT standard, but also to the GAP profile defined within the DECT standard, are able to interoperate for basic calling. The DECT standard includes full testing suites for GAP, and GAP products on the market from different manufacturers are in practice interoperable for the basic functions. The DECT media access control layer also provides encryption services with the DECT Standard Cipher (DSC). The encryption is fairly weak, using a 35-bit initialization vector and encrypting the voice stream with 64-bit encryption. The security algorithm has been decoded. Another attack involves impersonating a DECT base station, which allows calls to be listened to, recorded, and re-routed to a different destination. While most of the DECT standard is publicly available, the part describing the DECT Standard Cipher was only available under a non-disclosure agreement to the phones' manufacturers from ETSI. On 8 June 2002, a posting was made to the alt.anonymous.messages newsgroup containing what was claimed to be the reverse engineered source code of the implementation of the DECT Standard Cipher for the Samsung SP-R6150 telephone. This claim has since been refuted. In 2008, members of the deDECTed.org project actually did reverse engineer the DECT Standard Cipher, and as of 2010 there has been a viable attack on it that can recover the key. Other interoperability profiles exist in the DECT suite of standards, and in particular the DPRS (DECT Packet Radio Services) bring together a number of prior interoperability profiles for the use of DECT as a wireless LAN and wireless internet access service. With good range (up to 200 metres (660 ft) indoors and 6 kilometres (3.7 mi) using directional antennae outdoors), dedicated spectrum, high interference immunity, open interoperability and data speeds of around 500 kbit/s, DECT appeared at one time to be a superior alternative to Wi-Fi. The protocol capabilities built into the DECT networking protocol standards were particularly good at supporting fast roaming in the public space, between hotspots operated by competing but connected providers. The first DECT product to reach the market, Olivetti's Net3, was a wireless LAN, and German firms Dosch & Amand and Hoeft & Wessel built niche businesses on the supply of data transmission systems based on DECT. However, the timing of the availability of DECT, in the mid-1990s, was too early to find wide application for wireless data outside niche industrial applications. Whilst contemporary providers of Wi-Fi struggled with the same issues, providers of DECT retreated to the more immediately lucrative market for cordless telephones. A key weakness was also the inaccessibility of the U.S. market, due to FCC spectrum restrictions at that time. By the time mass applications for wireless Internet had emerged, and the U.S. had opened up to DECT, well into the new century, the industry had moved far ahead in terms of performance and DECT's time as a technically competitive wireless data transport had passed. DECT operates in the 1880–1900 MHz band and defines ten channels from 1881.792 MHz to 1897.344 MHz with a band gap of 1728 kHz. Each base station frame provides 12 duplex speech channels, with each time slot occupying any channel. DECT operates in multicarrier/TDMA/TDD structure. DECT also provides Frequency-hopping spread spectrum over TDMA/TDD structure. If frequency-hopping is avoided, each base station can provide up to 120 channels in the DECT spectrum before frequency reuse. Each timeslot can be assigned to a different channel in order to exploit advantages of frequency hopping and to avoid interference from other users in asynchronous fashion. XDECT R is a marketing term used by Uniden for its products for extending the range of DECT phones (apparently indefinitely) by using multiple repeater stations. The company has demonstrated the technology to a 2.2 kilometres (1.4 mi) range in Australia. Typically DECT handsets use replaceable rechargeable batteries (e.g. a pair of AAA NiMH). Charge control sophistication varies but can cause limited battery endurance. Replacements should not be fully/over charged before fitting because some phones (e.g. Gigaset S79H) detect the voltage and will not work if mistaken for primary cells. DECT is a UHF technology, with science similar to mobile phones, baby monitors, Wi-Fi, and other cordless telephone technologies, though the UK Health Protection Agency (HPA) claims that due to a mobile phone's adaptive power ability, a DECT cordless phone's radiation could actually exceed the radiation of a mobile phone (a DECT cordless phone's radiation has an average output power of 10 mW but is in the form of 100 bursts per second of 250 mW, a strength comparable to some mobile phones). Typical to such wireless technologies, by consensus there are negligible health effects from very low levels of non-ionizing radiation. Most studies have been unable to demonstrate any link to health effects, or have been inconclusive. Nevertheless, there has been persistent controversy over their health safety, and some national and international agencies have made specific recommendations about exposure. ↑ "Digital Enhanced Cordless Telecommunications (DECT); A high level guide to the DECT standardization". ETR 178. European Telecommunications Standards Institute. 1997. Retrieved 23 September 2010. ↑ "Dect for Cordless Terminal Mobility" DECT Forum Newsletter 6 March 1998 . ↑ "LA TELECOM SPEGNE "FIDO"" Il Messaggero 5 April 2000. 1 2 3 4 Schuler, Andreas; Tews, Erik; Weinmann, Ralf-Philipp (29 December 2008). "What is DECT?". deDECTed.org. Archived from the original (PDF) on 15 September 2016. Retrieved 15 September 2016. ↑ "BigPond Shopping". Archived from the original on 19 July 2012. Retrieved 15 September 2016. ↑ "Beware of Buying Radiocommunications Equipment not Meeting Prescribed Specifications". Office of the Communications Authority. ↑ "Serious security vulnerabilities in DECT wireless telephony". Heise. 29 December 2008. 1 2 Nohl, Karsten; Tews, Erik; Weinmann, Ralf-Philipp (4 April 2010). "Cryptanalysis of the DECT Standard Cipher" (PDF). Archived from the original (PDF) on 25 July 2011. ↑ "Do you like ice cream?". Newsgroup: alt.anonymous.messages. Usenet: adsq2u$p00$1@wanadoo.fr. ↑ Weinmann, Ralf-Philipp (26 January 2009). "DSC - Reverse Engineering of the Samsung DECT SP-R6150". ↑ "Wireless LANs: developments in technology and standards". IEE Journal of Computing and Control Engineering. October 1994. ↑ Independent Advisory Group on Non-ionising Radiation (April 2012). "Health Effects from Radiofrequency Electromagnetic Fields". (UK) Health Protection Agency. Retrieved 10 September 2013. ↑ "What are the health risks associated with mobile phones and their base stations?". Online Q&A. World Health Organization. 5 December 2005. Retrieved 19 January 2008. Tuttlebee, Wally H.W. (1996). Cordless Telecommunications Worldwide. Springer. ISBN 978-3-540-19970-0. Phillips, John A.; Mac Namee, Gerard (1998). Personal Wireless Communication with DECT and PWT. Artech. ISBN 978-0-89006-872-4. Prof. Dr. W. Kowalk (13 March 2007). "Rechnernetze – The DECT Standard". Retrieved 2008-12-29. Wikimedia Commons has media related to DECT telephones.